Paints and Finishes from FLAG - collected together in a product browser. Information, & datasheets to help product selection. Acid Etch Solution is a pre-treatment for concrete power floated or very smooth concrete floors. The Acid Etch Solution opens the pores of the concrete and prepares the surface to accept its next treatment, allowing excellent adhesion. Coverage: Approx. 20 sq. meters per litre. Effectively primes, seals and blocks stains for a wide variety of interior and exterior surfaces. A ‘bond coat’ primer that’s great for hard-to-stick surfaces, offering excellent adhesion with minimal preparation. Also prevents rust formation when applied over clean ferrous metal such as iron and steel. Universal Primer contains a biocide that protects the dried coating against fungal degradation, making it ideal for high-humidity areas such as bathrooms and utility rooms. The ultimate shellac-based primer and stain blocker. Offering excellent adhesion to glossy surfaces - even glass. Blocks stubborn and persistent stains. The advanced shellac formula seals porous surfaces with excellent enamel holdout, even sealing bleeding knots and sap streaks. Suitable for use on water stains, fungal degradation, nicotine, oil stains, marker pen stains and more. Designed to permanently block odours (from smoke and fire damage to odours from pets and nicotine). The dried film is non-toxic and hypo-allergenic and may be used in areas where incidental contact with food items occur. Ideal for interior ceilings, walls, doors and general paintable surfaces. Including spot priming on wood, metal, trims and PVC. An interior / exterior primer/sealer, stain sealer and bonding coat that dries for over-coating in only two hours. Stains of all kinds are permanently sealed so topcoats are blemish free, and is especially effective on nicotine and water stains. Can be primed, sanded and top-coated the same day, saving time and money. Designed to resists cracking and peeling and is compatible with most decorative top coats. Contains a biocide that protects the dried coating against fungal degradation. This paint is designed to resist cracking, peeling and blistering to avoid constant maintenance. Omni-White bonds to existing painted surfaces and promotes adhesion on a wide range of surfaces with minimal preparation. Omni-White also seals porous surfaces and is ideal for use in areas of persistent high humidity, frequent temperature changes and poor air circulation. A primer and finish coat. Washable, scrubbable, stain and moisture resistant finish. Self-priming – adheres to the surface with minimal preparation. A fade resistant coating. Water-based, low odour and quick drying. An off-white primer of very low lead content for brush or spray application. Designed for cementitious type surfaces with an alkaline nature. Bright Aluminium high gloss finish is based on a high quality alkyd resin system suitable for interior and exterior use. This product achieves a high standard finish giving excellent durability. Manufactured in the UK by FLAG Paints Ltd.
A multi purpose primer. Particularly valuable in minimising "bleeding" on the more resinous types of timber. Formulated to seal knots and prevent resin seepage, This primer is ideal for both interior and exterior applications. The original self-knotting primer which for many years has proved the most successful product of its kind. Anti-climb paint is a thick glutinous coating. In appearance it is similar to smooth gloss paint when applied but remains slippery indefinitely so preventing any intruder from gaining a foothold. It is very difficult to remove from clothing. Anti-climb paint continues to work in hot or cold weather conditions adhering to the surfaces to which it is applied. Note: As a lawful requirement do not apply under 2m height, users must erect a warning sign after Anti Climb has been applied. Manufactured in the UK by FLAG Paints Ltd. Theoretical spreading rate: 2.5 litres per sq. metre. Item: White sign with red warning text. Legal: A lawful requirement when using this type of product. 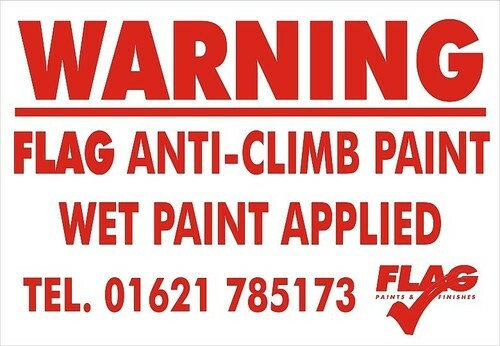 Restriction: Do not apply Anti Climb Paint under 2m height. High build quick air-drying oxide primer for use on ferrous metals, provides good protection prior to over coating with most solvent based finishing products. Suitable for a wide variety of applications where speed and ease of application are required. 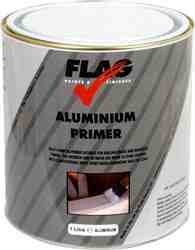 Compatible with FLAG Hammer Finish and FLAG Smooth Metal paints. High quality one coat anti-rust metal paint. Based on Micaceous Iron Oxide. This high build primer is suitable either for brushing or spraying purposes. Provides excellent adhesion to ferrous metals and imparts good water resistance. Manufactured in the UK by FLAG Paints Ltd.
Anti slip polyurethane floor paint based on a high quality resin system with a very fine textured finish. It is suitable for application to most surfaces and will provide a hard wearing, water and oil resistant finish, this product is ideal for general walkways, factory and garage floors. *Important Note: This product has anti-slip properties and therefore provides slip resistance, however, it is not possible to guarantee a totally non-slip surface. Manufactured in the UK by FLAG Paints Ltd. Click here to view the slip resistance test certificate. FLAG Anti Slip PU Floor Paint (Safety Yellow) is a heavy duty, quick drying polyurethane paint with a durable, chemical resistant and slip resistant finish. Ideal for high visibility safety markings. Anti slip PU floor paint (PU is an abbreviation of polyurethane) based on a high quality resin system with a very fine textured finish. It is suitable for application to most surfaces and will provide a hard wearing, water and oil resistant finish, this product is ideal for general walkways, factory and garage floors. *Important Note: This product has anti-slip properties and therefore provides slip resistance, however, it is not possible to guarantee a totally non-slip surface. Manufactured in the UK by FLAG Paints Ltd. Click here to see the slip resistance test certificate. A quick drying non-toxic low odour single pack water based acrylic paint designed to seal, colour and protect concrete floors. Contains dolomite stone for added strength and anti-slip* properties. Excellent water, petrol and oil resistant also ideal for general walkways. Excellent long lasting durability and colour retention. The toughest water based acrylic floor paint that FLAG has ever made! *Important Note: This product has anti-slip properties and therefore provides slip resistance, however, it is not possible to guarantee a totally non-slip surface. Stir well before use. Mix tins with different batch numbers together before use. Caution: Protect from frost when stored. Do not apply if surface temperature is below 10°C. Manufactured in the UK by FLAG Paints Ltd. Click here to view the slip resistance test certificate. 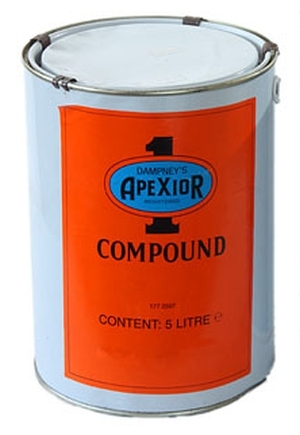 Apexior No.1 is a special graphite/bitumen compound, designed to act as an anti-corrosive coating for metal surfaces in continuous contact with hot water above 93°C (200°F). It has also been proven to be unaffected by steam reaching temperatures of 540°C (1004°F) while actually improving the boiling characteristics/steam generation patterns of the boiler/plant in which it is used. Indeed it has been shown that heat transmission is increased by up to 35% by the use of this product, giving real energy efficiency and cost savings. It is very easy to apply and maintain and imparts no smell, or discolouration to liquids with which it comes into contact. Price on request. Apexior No.3, is an ideal anti-corrosive coating for metal surfaces in continuous contact with fresh or salt water at temperatures up to 52°C (125°F). To add to its versatility, Apexior No.3 also has a wide range of marine applications and is resistant to dry heat up to 232°C (450°F). It is as easy to apply and maintain as Apexior No.1 and shares the same properties - it to imparts no smell or discolouration to liquid. Price on request. A clear single pack water-borne algicidal wash. For use as a surface biocide. A very effective biocide to clean and protect against mould, lichens and algae. Suitable for use on internal and external areas, including ceiling and walls, garden paths, patios, driveways and roofs. Long term protection against re-growth. Simple to apply. Can be over-coated with most conventional paints. For further protection overcoat the treated areas with Asipo paints. Dilute with 4 parts water to 1 part Asipo Algicidal Treatment. Manufactured in the UK by FLAG Paints Ltd. The Asipo range has been specially formulated for use in high risk areas where humidity and condensation can lead to the growth of mould and algae. Asipo Internal is a superior water-based decorative emulsion for combating internal problems of mould growth. This product provides long-term protection from mould and algae and is designed to stop contamination and discolouration. Asipo Internal is an economical solution but a high quality product. Easy to apply, providing a long lasting durable finish. Manufactured in the UK by FLAG Paints Ltd.